No, sorry. Her acting is decent. I prefer an unknown actress or a newcomer to play the role of Ariel, just like what they did with Auli'i Cravalho in Moana. I'd personally prefer an unknown/newcomer to play the role of Ariel as well. But Ariana hasn't been given much of a chance to show her acting talent because, outside of her Broadways days from before she became more well-known, she's always been typecasted as the dumb and ditzy character. Such as Cat from Victorious and Sam & Cat, Chanel Number 2 from Scream Queens, and Penny from Hairspray. So I don't think those are fair roles to show her true acting abilities. But again, I would prefer an unknown actress to play the role of Ariel. @uploaded900: But you think Emmy Rossum would be a great Belle? link. As for Ariana, I wouldn't exactly say she's a GREAT choice, but I wouldn't mind if she were cast as Ariel. @hatelarxene Do you always have to bring up Emmy Rossum with everything? You're one of my closest friends but you need to learn to be more respectful. Anyway, I found some clips of her acting in SNL, which actually got Steven Spielberg to ask Ariana to be in one of his movies because he was impressed by her acting. That should say something because of what a LEGENDARY director Spielberg. I don't get what's the big deal with that Rossum thing? When people delete all their "Emmy Rossum should've been cast as Belle" comments from the Internet, then I'll stop bringing her up. Which is never going to happen. Because she has a lot of fans, for some reason. Besides, Emma Watson haters always have to bring up Emma with everything just to hate on her, so why shouldn't I do the same with Rossum? I'll learn to be more respectful when Emma's haters and Rossum's fans learn to be more respectful. Shouldn't you try to be a bigger person and not just act like those annoying haters? It doesn't make you much better than they are to act like this and I know you're better than that. 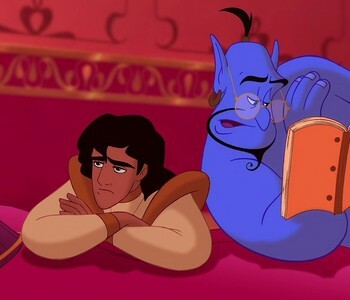 What is the title of the cream book that Genie reads in this picture?